On January 16, 2014, a bipartisan group of Members of Congress introduced the Voting Rights Amendment Act of 2014 (“VRAA”). Congressmen John Lewis (D-GA-5), James Sesenbrenner (R-WI-5), Steve Chabot (R-OH-1) and John Conyers, Jr. (D-MI-13), among others, introduced H.R. 3899 in the House. Senator Patrick Leahy (D-VT) and other Senators introduced a companion bill, S. 1945, in the Senate on the same day. Although not perfect, the VRAA is an important first step toward restoring the voting rights protections now at risk because of the U.S. Supreme Court’s decision last June in Shelby County, Alabama v. Holder. Since 1965, Section 5 of the Voting Rights Act (the “Act”) has required certain jurisdictions (states, counties, cities, and towns) with a history of chronic racial discrimination in voting to submit all proposed voting changes to the Department of Justice or a federal court in Washington, D.C. for pre-approval. This requirement was commonly known as “preclearance.” For nearly 50 years, Section 5 preclearance has served as our democracy’s discrimination checkpoint by halting discrimination in voting before it occurred. Section 4(b) of the Act was the provision by which Congress determined which jurisdictions are “covered” and therefore which jurisdictions were required to seek preclearance. On June 25, 2013, the Supreme Court issued a decision in Shelby County, Alabama v. Holder. In this case, Shelby County challenged the constitutionality of Sections 4(b) and 5 of the Act. LDF vigorously defended the Act’s constitutionality in the Supreme Court and in the lower courts. In a blow to the essence of the preclearance process, however, the Supreme Court ruled that Section 4(b) was unconstitutional. The Court held that the coverage provision was out of date and not responsive to current conditions in voting. The effect of Shelby County was to suspend the preclearance requirement for all jurisdictions covered by Section 4(b)—those jurisdictions with the worst records of discrimination in voting. Before the decision, preclearance applied to nine entire states, mostly in the South, including Alabama, Alaska, Arizona, Georgia, Louisiana, Mississippi, South Carolina, Texas, and Virginia, and a number of counties, cities, or towns in six partially-covered states, including California, Florida, Michigan, New York, North Carolina, and South Dakota. After Shelby County, these states and jurisdictions are free to implement changes in voting without having to go through the preclearance process to determine whether they are discriminatory. The VRAA represents a measured, flexible and forward-looking attempt by Congress to update the Voting Rights Act in response to the Supreme Court’s ruling in Shelby County. The VRAA contains several components which respond directly to the Court’s directive that preclearance be linked to recent acts of discrimination while seeking to provide victims of voting discrimination, and the courts that hear their claims, the tools to detect and prevent voting discrimination before it takes effect. A New “Rolling Coverage” Provision. This measure will subject jurisdictions with a recent history of voting discrimination to Section 5 preclearance. Accordingly, jurisdictions which have committed a certain number of statewide and local “voting rights violations” in the last fifteen years will be required to submit their proposed voting changes for preclearance before those changes can be implemented. Once a jurisdiction falls under coverage, it will be subject to preclearance for at least ten years. A “voting rights violation” is defined as (a) any preclearance objection under either Section 5 or Section 3’s “bail-in” provision (which at present allows a court to require a jurisdiction to submit to a preclearance process, like the one under Section 5, if the court finds that the jurisdiction has engaged in unconstitutional intentional discrimination); (b) a judicial denial of a request for preclearance; or (c) any judicial finding that a jurisdiction has violated either the U.S. Constitution or Section 2 of the Voting Rights Act. A state will be wholly covered if five voting rights violations have occurred within the state over the last fifteen years and the state committed at least one of these violations. 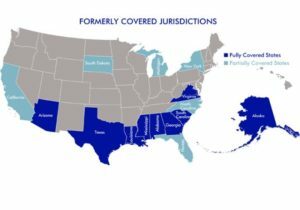 For example, under the new rolling coverage provision, the State of Texas in its entirety (i.e., the state and all of its counties and cities) will likely become covered again because it has met the threshold number of voting rights violations. It is believed that Mississippi, Georgia and Louisiana would also immediately be covered. A local jurisdiction will be covered either (a) if it has committed three local-level violations over the last fifteen years or (b) if it has committed one local-level violation and has a “persistent and extremely low minority voter turnout” as defined in the VRAA. For example, Charleston County, South Carolina and Northampton County, Virginia will likely be covered because each has committed at least three voting rights violations in the last fifteen years. Any state or local jurisdiction can come under the preclearance requirement if, within a fifteen-year window, it commits the requisite number of voting rights violations. Thus, the new rolling coverage provision is applicable nationwide. Any state, county or city that has repeatedly violated the voting rights of communities of color—regardless of whether the jurisdiction was previously subject to preclearance—could become covered under the VRAA. Enhances the Ability to Stop Discriminatory Laws Before Their Harm Takes Root. The VRAA would enhance the ability of victims of voting discrimination to obtain a “preliminary injunction”—i.e., a court order to stop jurisdictions from implementing potentially discriminatory voting changes before any harmful changes can go into effect. In deciding whether to halt a voting change, courts could consider, for example, whether the potential burdens on voters outweigh the alleged burdens placed on a jurisdiction in not enforcing the law, and whether the jurisdiction gave adequate notice of the change. Amends the Existing “Bail-In” Provision. 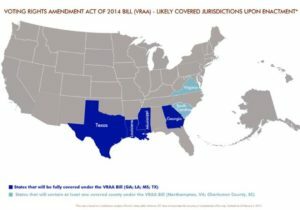 The VRAA will allow a court to use preclearance as a remedy when a jurisdiction commits a federal voting rights violation. Currently, the Act permits a court to subject a jurisdiction to Section 3(a)’s bail-in preclearance provision if the court finds that the jurisdiction engaged in unconstitutional intentional discrimination. The VRAA would remove the requirement that the voting rights violation was the result of intentional discrimination. This allows courts to have the flexibility they need to address all potential forms of discrimination. and stop the implementation of Texas’ discriminatory photo ID law! Nationwide Notice Provisions Promote Transparency and Improve Enforcement. The VRRA strengthens requirements that the public receive notice before any state and most local jurisdictions across the country implement a wide array of voting changes, including changes to voter qualifications, the locations of polling places, methods of election, and redistricting, which potentially can harm voters of color. Any jurisdiction that fails to provide public notice of a change within a specific period of time before an election would be prohibited from denying a citizen the right to vote solely based on his or her failure to comply with the requirements of that particular change. voting changes planned for your community. Expands the Federal Observers Program. The Department of Justice would now be allowed to send Federal Observers to monitor elections in jurisdictions covered under either the new rolling coverage provision or Section 203 of the Act, an existing provision that requires certain jurisdictions to make elections more accessible to language minorities by providing bilingual election materials and translators. The VRAA represents a threshold but significant step by Congress toward ensuring that communities of color are protected against voting discrimination in the wake of the Shelby County decision. LDF pledges to be a leader in the national effort to ensure that, by the time of its final passage by Congress, the VRAA legislation is as strong and effective as possible in protecting voting rights. We will work with our clients, our communities, and every Member of Congress to ensure that the promise of democracy is fully realized. As currently drafted, the VRAA contains some problematic aspects which we hope to address as the legislation moves through Congress. First, we want to ensure that states and jurisdictions with long and sordid histories of voting discrimination are also closely monitored for potential voting rights violations. In a similar vein, we want those types of voting changes that are most likely to result in discrimination to warrant closer scrutiny. Third, we will work to ensure that all forms of discrimination in voting, including discriminatory photo ID requirements, are counted in a state’s or jurisdiction’s record on voting discrimination.